Mark Your Calendars for National Margarita Day! Written by Barito Tacos & Cocktails on January 28, 2019 . Posted in Blog, Cocktails, Holidays & Celebrations. National Margarita Day is on its way! Mark your calendars for February 22 and make your way to Barito Tacos & Cocktails to celebrate. Learn more about National Margarita Day by reading on. Every year on February 22 we celebrate National Margarita Day. Margaritas are a tequila-based cocktail served in the United States. In addition to tequila, most margaritas are also made with triple sec and lime or lemon juice. The key ingredient to a margarita is the lime. In the U.S., most margaritas are served with a thick-skinned Persian lime, while softer drinks are made with lemons. 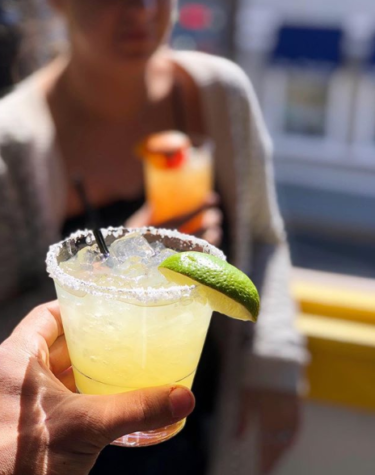 We don’t know for sure how the margarita was created, but we do know that individuals who drink tequila straight chase the beverage with a wedge of lime and a lick of salt. This makes the tequila more enjoyable to drink. The first bartender to make a margarita combined the tequila with the lime wedge and the salt to create a more cohesive and pleasant beverage. The salt was added to the rim of the glass to help with the kick, while the lime was squeezed into the tequila for a vibrant flavor. Margaritas created by creative bartenders are also served with dried herbs, infused sugars, and exotic salts for an extra kick of flavor. Come sip on a margarita at Barito. Our El Barito Classico margarita consists of Blanco tequila, orange, lime, agave, and triple sec. This National Margarita Day, Barito Tacos & Cocktails is the place to be. Come see us on February 22 at 201 Main Street in Port Jefferson for this enjoyable holiday. We hope to see you soon!